I heard through the grapevine that some of my valued fans were disappointed when they saw one of my recent creations - not only was it not deep fried, it actually contained vegetables. Well, there's no fruit or veg to be found in this one. 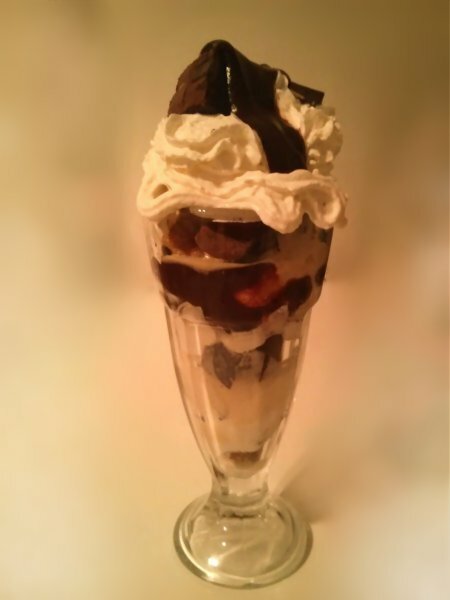 An ice cream sundae, packed with chunks of chocolate brownie, caremelised nuts, pieces of chocolate, and hot chocolate fudge sauce. 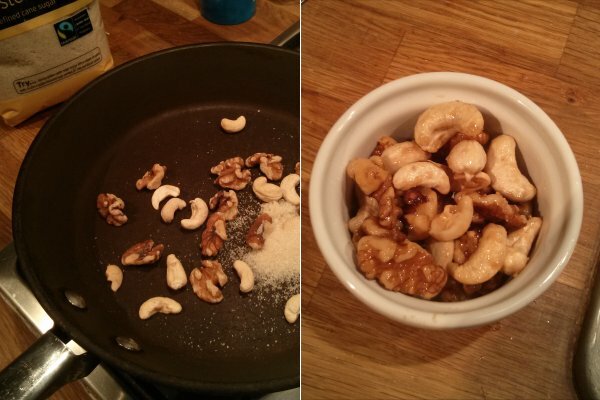 I put cashews and walnuts in a dry pan, and heated until they were slightly toasted. I then added a few spoons of sugar, and continued to heat until it turned slightly brown. Then the magic happens - add a knob of butter and a splash of water, and the sugar instantly dissolves. The water evaporates in a few seconds, and you're left with a thick sticky glaze covering the nuts. When cooled, this sets into a hard coating around each one. These would make a fine snack on their own (possibly with a sprinkling of salt... everybody loves salty sticky nuts), but these were destined for greater things. 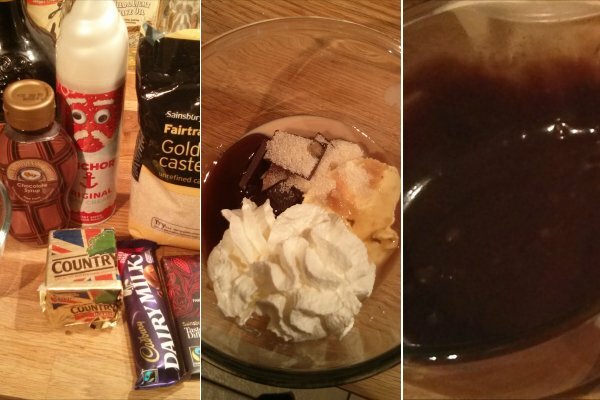 I took chopped milk chocolate and dark chocolate, a lump of butter, some chocolate syrup, sugar, cream, and a glug of baileys. I nuked the whole lot in the microwave for a few seconds, resulting in a smooth, silky, shiny, and sickly sweet hot chocolate fudge sauce. A good chocolate brownie should be crispy on top, and gooey on the inside. 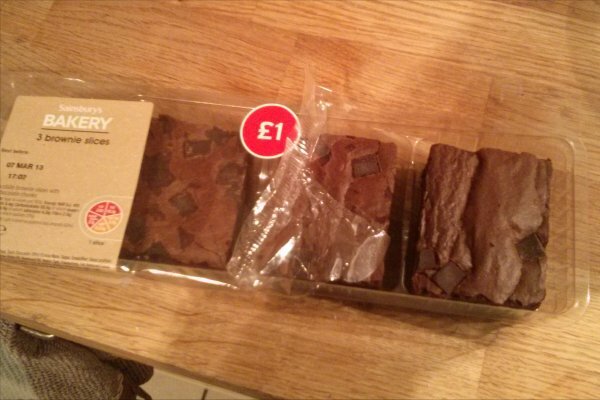 These were not good brownies. But they were they best I could do at 9pm in suburban south London. 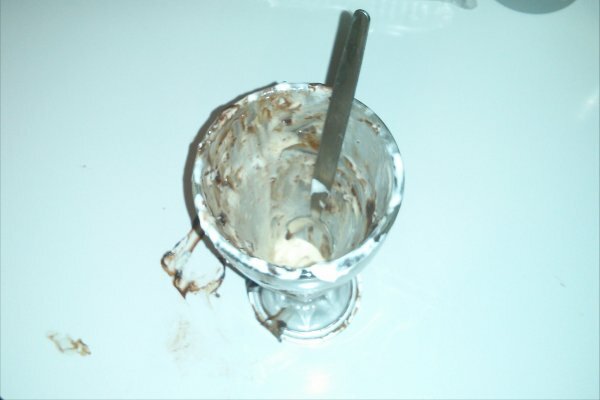 I chopped two of the brownies into cubes, and then started to put the sundae together. 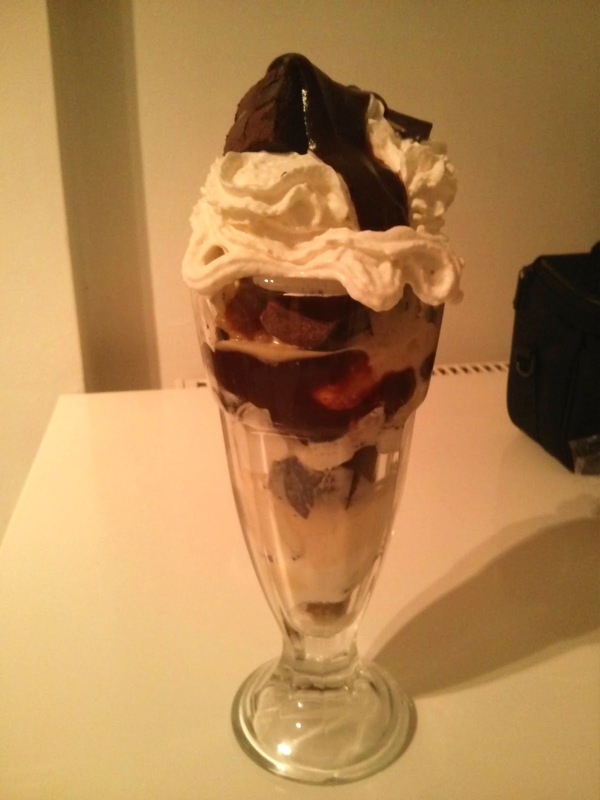 I crammed the chopped brownie into the sundae glass, along with the nuts, the remainder of the chocolate (chopped into chunks), three scoops of vanilla ice cream, the hot chocolate fudge sauce, and loads of squirty cream. The obvious drink pairing would be a classy dessert wine - perhaps a glass of Sauternes, or a fine German Eiswein. But on this occasion, I made a shooter from Baileys mixed with melted chocolate, topped with vanilla vodka. 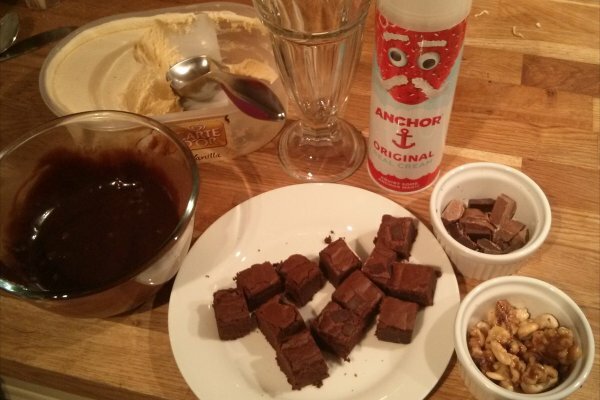 It tasted great - in particular, the hot chocolate sauce was bloody brilliant - but this is one of the few things I've ever eaten which has genuinely made me feel physically sick. Upon reflection, a single dessert which contains two bars of chocolate, two brownies, and three scoops of ice cream, is too much even for me. I don't usually approve of sharing desserts, but on this occasion, it may have been wise.